2016 has been a year of accomplishments for the Chardon Toastmasters Club. As the year unfolded eight new names were added to the club roster. David Lindsay (Chardon) led the way joining the club in January and was quickly followed in February by Hannah Brown (Chardon) and Heather Martello (Jefferson). Peter Lindsay (Chardon) and Michael Richmond (Mentor) joined in April. Lake Erie College International student, Nemanja Josic (Serbia), joined in July and Faith Huber (Chagrin Falls) followed in August. Connor R. Powers (Eastlake) is the newest member joining in November. These new Toastmasters join a diverse and engaging group made up of members from 5 counties: Ashtabula, Cuyahoga, Geauga, Lake, and Portage. Toastmasters learn and grow not only from prepared speeches presented before their clubs and at various outside speaking opportunities, but also from competing. Competition takes speakers out of their comfort zone as they test their abilities against those of other Toastmasters. This year several of the more experienced Chardon club members competed and were successful at the Club, Area, and Division level. Jonathan Cooney, Amy Patterson, Gary Hedrick, Chris Martello, Marilyn Harman, and Nancy Temple all competed successfully at various levels. The culmination of the contests is the District 10 Competition. 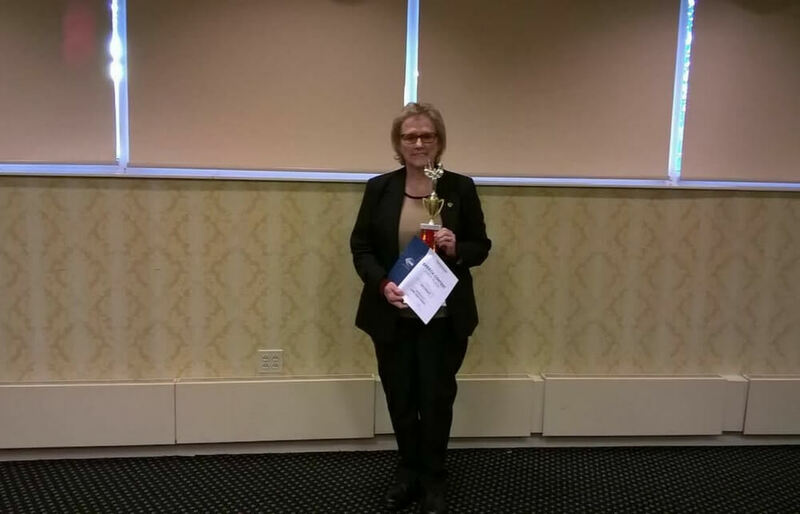 The Fall District Contest, held earlier this November, was another success for the club as Juel Leonard, (Bainbridge Township), was awarded first place in the District 10 Table Topics Competition. Those who win at the District level have won from a field of over 2,000 Toastmasters from over 100 clubs that make up the Northeast Ohio District 10 membership. The addition of new members and success in competitions were just two of the accomplishments out of several that resulted in the club being honored with the designation of “President’s Select Distinguished”. Fewer than 2% of Toastmasters Clubs worldwide achieve this distinction. It is no wonder that those who want to improve their public speaking and leadership skills find their way to Chardon Toastmasters. Meetings are open to the public and are held at 6:30 every Thursday at the Western Reserve Land Conservancy office at 102-C East Park on Chardon Square. Toastmasters International is a world leader in communication and leadership development. Our organization has more than 345,000 memberships. 15,900 clubs in 142 countries make up our global network of meeting locations. The Toastmasters mission is to provide a supportive and positive learning experience in which members are empowered to develop communication and leadership skills, resulting in personal growth.